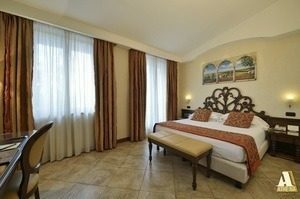 This pleasant 4* hotel represents excellent value and an enviably located in the centre of Siena. Here, you can expect a warm welcome from the friendly reception team and a comfortable, serene stay. 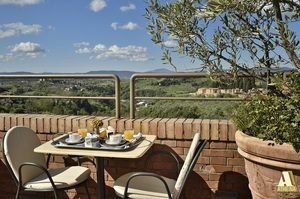 Perfectly located in the heart of Siena, inside the ancient city walls, Hotel Athena is a perfect Superior grade base from which to explore the town. 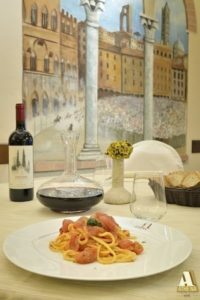 Within easy walking distance is the Piazza del Campo, the Cathedral and the Torre del Mangia. It costs around 10 Euros to reach the hotel by taxi from the station or for guests arriving by car, complimentary parking is offered on-site. The hotel offers all of the facilities that are expected of a 4* establishment, such as a multi-lingual reception team, complimentary WIFI, lift access to all floors and a restaurant. One of the hotel’s most exciting features is its panoramic terrace, where guests can drink the aperitivo whilst admiring breathtaking views across the Tuscan countryside. We particularly recommend visiting the terrace at sunset for the very best views and snacks can also be ordered. Five grades are proposed across 100 rooms; Economy, Standard, Superior, Deluxe and Executive. The rooms are decorated in different colour schemes, from greens to browns and oranges, and are equipped with a large double bed or two single beds, air-conditioning and heating, a safe, a desk, a telephone, a flat-screen TV, a mini-bar and en-suite facilities including a hair-dryer, slippers and bath products. Irons and ironing boards are available upon request at the reception.